We offer a great selection of home products to choose from. To learn more visit the manufacturer websites below. 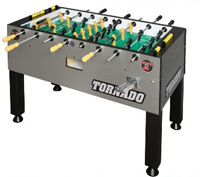 The home version of Valley's most popular coin-operated pool table, the Tiger can stand up to the toughest environment. 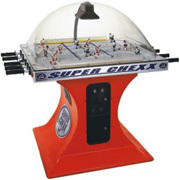 The ICE Super Chexx Bubble Hockey Table is the original and still the best dome hockey game around. In this classic arcade game, two players control five hockey players each by sliding and spinning the rods, trying to knock the black puck into each others goals. 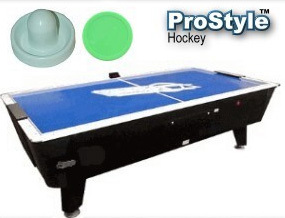 The automatic puck return system serves the hockey puck by popping it up from the middle of the playing field after every goal. For a truly exceptional bubble hockey experience, the overhead scoring mechanism records goals, shots on goal, period, and running time. The player to score the most goals before the time runs out wins. If a game is tied after the normal game play it will automatically go into sudden death overtime - so theres always a winner on the ICE Super Chexx Bubble Hockey Table! Some things just get better with time. Nothing compares to the arcade originals. With 13 classic games, re-live the glory days of the arcade in your own home. Gather around with friends and family to experience the look, feel and sounds you can only get with the real thing. Share old memories with friends and family and make new ones for years to come.